NHL News : Furious fans call Vegas' Fleury a cheater following game vs. Jets! Furious fans call Vegas' Fleury a cheater following game vs. Jets! Do you love his tactic or do you hate it?! Last night should have been about Jets' Laurent Broissoit. The Jets backup goalie stopped a franchise-record 26 shots in the second period , en route for a season-high 43 saves, in Winnipeg's 4-1 victory over the Vegas Golden Knights on Tuesday night. On my part, I believe you have to love Golden Knights' Marc-Andre Fleury, who can always make people smile on and off the ice. However, some fans were enraged over a tactic he used during last night's contest and weren't afraid to call out the veteran netminder on social media. Fleury pulled off a tactic in an attempt to give his team an advantage late in the game as his head coach Gerard Gallant used his team’s timeout, down 2-1 with 2:23 left in the third period. 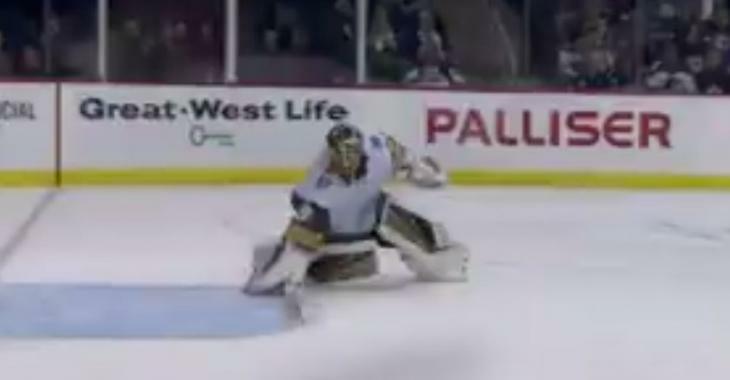 To give his team an edge, Fleury built a wall of snow in his crease to slow down pucks heading towards the empty net. He was caught and referees were quick to clear it. But he was also caught by fans who were quick to tell him they didn't approve of his tactic on social media. While some thought the move was brilliant - I mean come on, that's pretty good - others were quick to call him a cheater. The wall was taken down by the officials and we will never know if the score could have been different. The Jets managed to put home two empty net goals, scored by Kyle Connor and Mark Scheifele respectively, en route to a 4-1 victory in a game Winnipeg had been waiting for since the Canadian team was eliminated by Vegas during the Western Conference final back in May 2018. The Jets also remain in first place of the Central division and increase their lead over the Golden Knights in the Western conference by two points. Who knows? Maybe Fleury was trying to send a political message or was influenced by president Donald Trump and his wall conspiracy... However, it did not work for Fleury, who remains a legend for many fans across the National Hockey League.